A daybook may be a new term for you. To me, it's a very different kind of journal, not well understood. That’s why I continue to call daybooks reader’s notebooks on the pages of this Website. I fear you are not clear on what I mean. A daybook is a project book. Daybook users have clearly defined goals - an end in mind. The daybook isn't the goal. The product that results from keeping a daybook is. Leonardo DaVinci’s sketches and notes are in his notebooks. No one sees them. We admire his paintings and statues though - present as the result of the doodling he did in his notebooks on his way to creating a product. Let's say my project is to write a memoir as a keepsake for my family. I have rituals I keep developed over 20 years of keeping daybooks. Personally, I select an attractive, hard-covered composition notebook. The black-and-white notebooks of old will do, but I've come to enjoy selecting a colorful notebook. The cover must be hard enough to withstand the trips from home to school with me. I don’t want metal spirals that catch on my clothes either. I’m very particular as well I should be. I will be spending a lot of time with my daybook. On the first page, I write my name, my phone number and a plea for others to return my notebook should I lose it. On the second page, I write a goal in a concise paragraph so I know my focus. I leave 3 pages clear so I have room to create a Table of Contents. I will need to find things in my notebook as this project unfolds and therefore, I will need a system. I write the numbers on the pages. I get some scissors, sticky notes, and a glue stick to carry with me. Now, I'm ready. This ritual is the preparation I go through to get myself psyched for my project. It is my way of keeping a daybook. Let me say this clearly: there is no right way to keep a daybook. If you decide to try one, you have to find your way through it and so will your students. Until a couple weeks before the due date, I collect everything I need and many things that I don't for my memoir. Of course, I don’t know what I need, so I collect everything. I make lists of possible stories to tell. I collect samples of memoirs I love, make copies and glue them in my notebook. To know what I enjoy and what I'd like to try, I study what authors do and make notes. I interview people and write more notes in there. I try a few memoirs or maybe beginnings. I keep my daybook with me always. Ideas float to my conscience when driving a car, watching television, taking a shower. No matter. My daybook is nearby. I grab it and record the ideas to use later. The term daybook was coined by National Writing Project expert Donald Murray. I was inspired to try one when I learned he filled 200 daybooks in his lifetime. He said, "Everything I write during the day goes into my daybook," and that’s when the daybook was born. I adopted the term because I didn’t want my students to prejudge the notebooks they would be keeping. I did not wish for students to associate their daybooks with diaries or journals they may have kept, especially the boys. So, daybook it was, but you can see that what you call it doesn’t matter. I didn't know when I would use Murray’s quote, which is recorded in my daybook, of course. You may wonder how I could have so many stories to tell on this Website. How do I remember them all? I don’t. I wrote them in the many daybooks I kept when I taught. First minilesson: collect everything interesting because you don’t know what you will need. Eventually, I'm ready to write my memoir. After weeks of collecting and thinking, I sort through my collection of tidbits: topics, photos, quotes, interviews, false starts, and notes. Now I move from the daybook to the computer. The daybook is stored on a shelf with others where it is ready to be pulled down should I need it. I can find that something with my Table of Contents on my handwritten numbered pages. From now on, I work solely on my typed version of my memoir, reading to others, revising, editing and playing with the structure and layout like I normally would. Eventually, I publish my memoir to share with the public; the daybook remains a collection of notes that got me to that destination. To read and think, students need time and space to collect, digest, practice, and play. They take in information from lectures, work on daily assignments, and create long-term projects. Least understood is that students need time to play, create, make mistakes, and have some control over how they learn. Plus, the work is in one place. The notebooks stay in students' book bags. That way they always have daybooks at home and at school when needed. Students collect “stuff” for assignments, organized in meaningful ways. In the pages are class notes, exit sheets, reflection activities, homework, vocabulary lists, handouts glued on the pages, lists of books, warm ups, and drawings of concept words. Through the course of the year, readers store basically every thing they are asked to keep in order to build their learning. This is the teacher’s part. For students, the project part of school is clear: be a better reader, writer, and thinker. The daybook supports this work. Flip through the pages to find double-entry journal responses, lists of questions students want answered, reflections, notice-wonder charts, mind maps, and outlines. You’ll also find telephone numbers, sticky notes, pamphlets, color-coded pages, directions, Website URLs, sketches and other information that would get lost using other systems. This is the part where students have input. Play gives students confidence to trust themselves enough to go out and work. Teachers who want students to love and hold onto their daybooks, give students say over what to do with when they have those fragments of time Murray talks about. You will see: facts collections, graphic novels, songs, mazes, poetry, lists of interesting vocabulary words and math problems. The play choices are as different as the kids in your class. This part is totally personal to each individual. Visit these links for more information about daybooks. My website devoted to writing, where I go into detail on how to use daybooks. 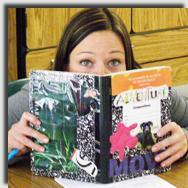 Check the bibliography page for math, science, social studies, special-area, and digital notebooks. Stenhouse authors regularly write about their own notebooks.